Back in November we saw reports that the Dev Alpha C device was in the works and that it would be limited to just 1,500 units for BlackBerry's most trusted developers to aid them in fine tuning their apps for the Q10. 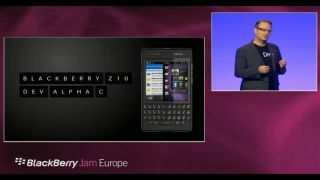 BlackBerry officially announced the Dev Alpha C and accompanying SDK yesterday at its Jam Europe event in Amsterdam. It tweeted: "BlackBerry launches new Dev Alpha C program so devs can begin to build apps optimized for the physical keyboard devices." The upcoming BlackBerry Q10 device will require developers to alter the size of their applications to fit on the square 720 x 720 display - thought to be around 3.1-inches - as well as provide support for the physical keyboard. There's still no word on the BlackBerry Q10 release date and we're sure BlackBerry will be keen to have most, if not all, the apps currently present in BlackBerry World optimised for the handset before it does go on sale. You can find out what we made of the QWERTY keyboard toting handset in our hands on BlackBerry Q10 review.